It’s Christmas time! 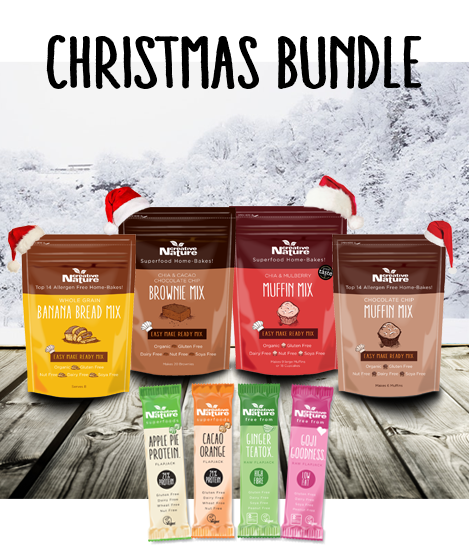 I’ve picked my favourite Christmas treats and bundled them all together to help you save. Merry Christmas! Instead of mistletoe and wine, we’re giving you a whopping 20% saving on our most Chistmassey items! 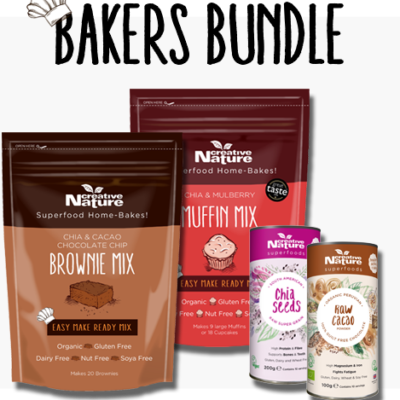 If you’re entertaining and want to keep it vegan, allergy-friendly or just want a healthier treat that still tastes amazing, we’ve got you covered. 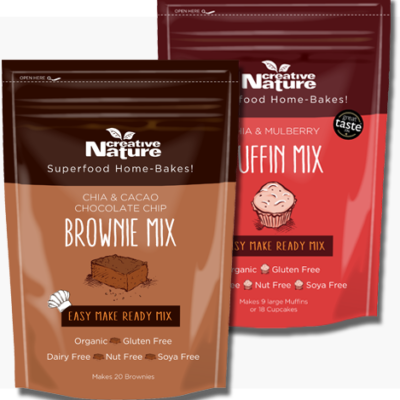 Organic Chia & Cacao Brownie Mix – The perfect mix to whip up your own Christmas Yule Log Cake! For an extra indulgent, vegan chocolate icing, check out our recipe here on Facebook. Organic Chia & Mulberry Muffin Mix – An excellent sweet treat to bring out when the board games are in full flow. Whether its Risk, Monopoly or festive charades, these muffins will keep you going! Organic Wholegrain Banana Bread Mix – Enjoy as an afternoon snack, after lunch dessert or cheeky morning pick-me-up. 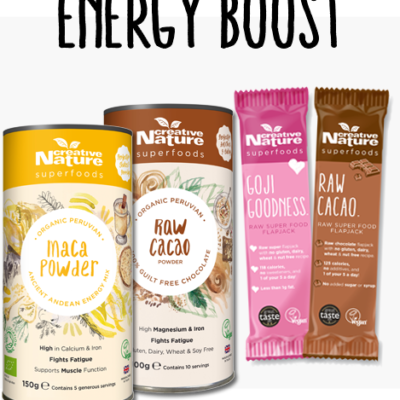 This mix will easily satisfy your sweet tooth, without any artificial sweeteners or refined sugar! As a bonus, it’s free from the top 14 allergens and can be made using the vegan method on pack, everyone’s happy! Organic Chocolate Chip Muffin Mix – When the kids are in need of a treat, look no further than these delicious vegan choc chip muffins. With wholegrain ingredients, a vegan recipe and none of the top 14 allergens, these muffins will cater for all. Apple Pie Protein Bar x 5 – Best enjoyed slightly warm, this allergy-friendly, high protein, high fibre snack is the perfect bar to take with you on the Christmas Day walk. It will keep you satisfied during a snowy (wishful thinking!) hike to burn off that Christmas Dinner! Cacao Orange Protein bar x 5 – It’s like Terry’s, just a healthier, vegan, high protein, high fibre version! The excellent treat to bring out after dinner, just cut the bars in half and indulge in a chocolate orange finger! Ginger Teatox Flapjack x 5 – Unique in the market, this ‘love it or hate it’ bar is excellent during the colder Winter days with a punch of Ginger to help fight the cold. It’s also got natural detoxing ingredients if you over indulge during the Christmas period! Goji Goodness Flapjack x 5 – The only cold-pressed bar to win 2 Great Taste Gold Stars and now a Quality Food Award winner!! This tasty, allergy-free treat is the perfect stocking filler to keep the little ones happy. They are all certified with The Vegan Society.